To purchase any of our CDs, click the "Add to Cart" button below the CD. 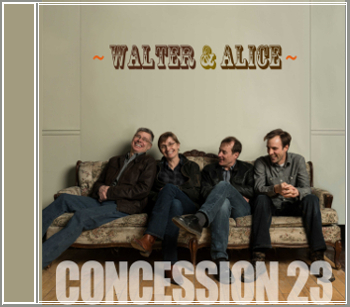 Concession 23 is pleased to announce the release of Walter & Alice, our latest, long-awaited, full-length recording. Nearly a year in the making, the album reflects our maturing musical confidence and a broad range of diverse musical tastes. As Sherry explains in the liner notes, "Everyone in the band chooses songs for different reasons." In our latest recording, we've collected hard-driving bluegrass standards, such as "Sophronie," a Jimmy Martin favourite; folk-inspired tunes such as the traditional "I Wish I Was a Mole in the Ground"; songs of love and loss, including the soulful "What Will Become of Me" and "What Was I Drinkin'? "; songs of retribution, like "I Wasted My Tears," and playful tunes such as "Don't Ease Me In". The title track is a ballad inspired in part by Kevin's mother who passed away in 2005 after a long struggle with Alzheimer's disease. The song is not overtly biographical; instead, it tells the story of a terrifying disease that afflicts thousands of Canadians each year through the lives of the fictional characters of Walter and Alice. it has quickly become one of our most-requested, signature songs. Walter & Alice also features more prominently than in previous recordings the impeccable voice of Sherry Philp, five-time winner of the Female Vocalist of the Year Award at the Central Canadian Bluegrass Awards. Her singing is heart-felt and moving, and is a big part of the Concession 23 sound. We're certain that Walter & Alice offers something for every bluegrass and folk music fan -- let us know what you think of it at info@concession23.com. Walter & Alice was recorded by studio sensation Jason Jaknunas at Metropolitan Studios, in Ottawa. Wandering Steps, is a tribute to some of the greatest bluegrass composers of the past, including Red Allen, Boudleaux Bryant, and Karl Davis & Harty Taylor, people who influenced the musical direction of the genre and inspired The Blue Sky Boys, the Everly Brothers, Bob Dylan and so many others. The recording features two original songs, each one reflecting a distinct but divergent stylistic trend in early American folk music. The title track, "Wandering Steps (and Slow)", is a reflective song about the archetypal journey from home to the grave. "I Wasn't Born in Carolina", penned by Kevin Golka, is an upbeat number about living, loving, and losing north of the 49th parallel. Wandering Steps, was recorded by studio wizard Jason Jaknunas at Metropolitan Studios, in Ottawa. Want to listen to some samples... ? If you have the flash player installed click on the yellow "play-arrow" beside the song title. If you don't see the arrow don't worry: just click on the text link, and it should open in a new window. Our first, full-length recording offers twelve, hard-driving, rhythm-based songs drawing equally from traditional and modern bluegrass composers. The project also includes 4 original recordings: "Albert Johnson", "On the Mountain Side", "To Tell the Truth", and "Write this Down". "Albert Johnson" has become open of our signature songs. It tells the true Canadian story of the Mad Trapper, a mysterious figure who shot and wounded an RCMP officer in the Canadian arctic in 1932. Incredibly, he managed to evade capture by outrunning his pursuers for nearly one and a half months during the dead of winter in what became the most famous manhunt in Canadian history. The Walls Around You was recorded by sound engineer and co-producer, James Stephens, at Stove Studios in Chelsea, Qu�bec. North to Ontario was the brain-child of Tom (Old Coot) McCreight, who instigated an annual recording project designed to promote Ontario bluegrass to the world. By invitation, bands were asked to record a single, original and previously-unrecorded song to the project. 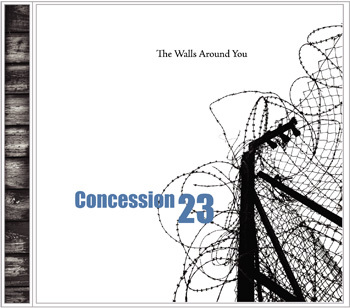 Concession 23 contributed original material in 2006, 2008 and 2010, when the project came to an end. 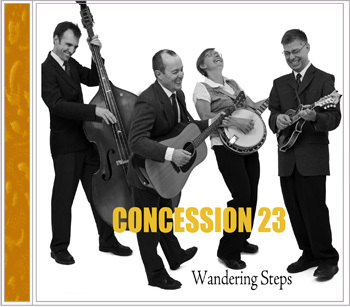 Concession 23 recorded "On the Mountainside" for North to Ontario 2006, which won Recording of the Year at the Central Canadian Bluegrass Awards.